I woke up from my afternoon nap (babysitting perk) with a mad craving for chocolate cake. I blame A who keeps posting photos of deep dark chocolate cakes on Facebook. My brain can only take so much visual stimulation so I decided I needed cake, pronto. 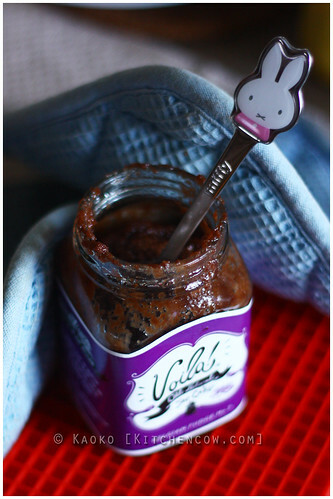 From the recesses of our cupboard, I unearthed a jar of Voila! Old Fashioned Jar Cake. 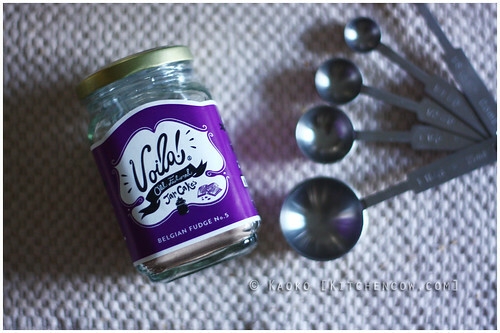 I got samples from a food event I went to last year and seeing the pretty jar, along with the memories of how it tasted, it felt like salvation. Down with the craving, yes to freshly baked chocolate cake. Never mind that my previous experiments with mug cakes were less than fantastic. I needed cake and I needed it yesterday. The instructions were simple enough. 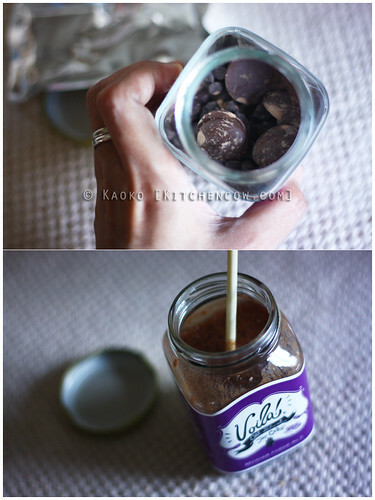 Dump everything in jar, stir, then microwave for a minute, a minute and a half, tops. I was pleased to see large buttons of chocolate topping the cake mix. I was in for a treat. In went the oil, then a few stirs later, I had an even batter that smelled so good. My craving, counting on being answered, was becoming more demanding. It seemed as if the little monsters in my stomach could sense appeasement at hand. I nuked it in the microwave for a minute. I decided to err on the side of caution. My experience with mug cakes told me that under was better than overbaked. As the microwave hummed and whirred, the marvelous scent of chocolate permeated from the machine. Steam escaped from the hot jar, needing careful handling with thick oven mitts. Yes, I stole my daughter’s spoon. I stabbed at the cake, eager for a bite, burning my tongue be damned. It was… gloopy. I tried nuking it for a few more seconds. It turned into stiffer chocolatey gloop. It was not at all like the sample I tasted, driving home the point that the failure was absolutely my fault. I have failed at supposedly foolproof microwave cake, making me the fool it wasn’t proofed from. I fail at life. And I still need my caek. This entry was posted in food & cooking, food spotlight. Bookmark the permalink.